Sunday 25 May 2008 13.00 � 17.00 on the ship HMS PRESIDENT Victoria Embankment, Blackfriars, London EC4Y 0HJ. Tube: Blackfriars and Embankment. Near Blackfriars Bridge, northern bank of the river, in front of Oxo Tower (see map here) Warning! MITITEI ON BOARD! 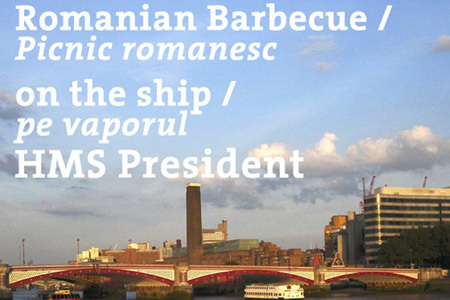 Get ready for a spicy May afternoon, (traditional) Romanian-style! Please confirm your participation so we can order the appropriate amount of food. Pre-booked tickets (payable at the door): �10/�8 concessions for RCC members (bring your RCC card). �9 concessions for students (bring your student card) and children under 12. Families welcome. Ticket includes BBQ food; food served until 15.00. Non pre-booked tickets �1 supplement. BOOK NOW! Avoid supplement! BOOK NOW! Places are limited. In order to avoid disappointment please book in advance. For bookings and further information e-mail: bookings@romanianculturalcentre.org.uk or Tel. 020 7439 4052, ext. 108.